Discussion in 'Modified 1991-1994 Explorers' started by cloaked_chaos, July 2, 2011. 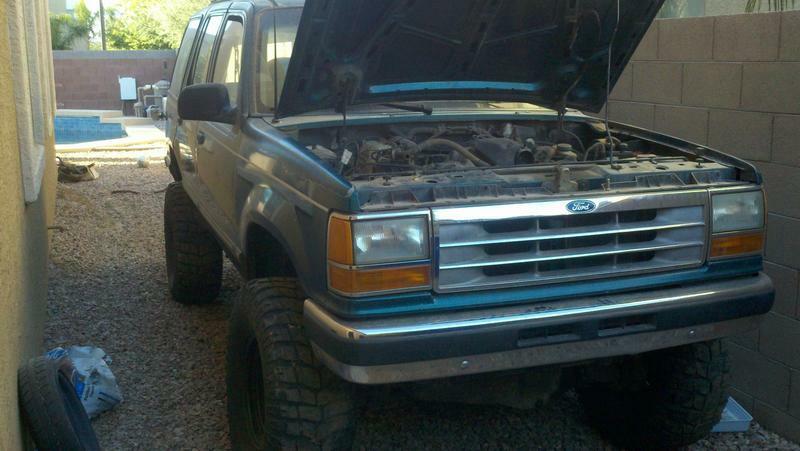 I recently picked up a 1994 Limited 4x4 explorer in great condition and have done a few mods to it including a nice sound system with two 12" subwoofers and a 1200 watt amp, spectre cone filter with 70mm maf housing, and a flowmaster 40 series muffler. While it's nice as it is, it just isn't enough for me. I scoured craigslist and came upon a badly worded listing with almost no details, and zero pictures. He said it was a 1993 explorer with some sort of lift. The asking price was right so I decided to have a look at it. I rode my motorcycle the 30 miles out there in 117 degree heat (terrible idea). When I got there I saw it and bought it immediately. Interior in bad condition, seats and dash look good though. I will be pulling all the lift parts and tow hitch off to inspect and install on the previously mentioned 1994 explorer. I will have to determine whether or not the gears have been upgraded. The best method I can think of right now is to jack up each axle, spin the tires 360 degrees and count the number of times the drive shaft turns. (Does anyone know of a better way?) I will also need to find out why the camber is so far off on the front right tire. I don't think I am going to swap the manual transfer case over since my pushbutton works just fine. I'm not sure what I am going to do with the rest of the car when I am done. It will still be a running and driving vehicle, just with a messed up body. Ripping off the body and turning it into a tube frame desert runner has crossed my mind, but if I were going to do that I would probably leave the lift on. 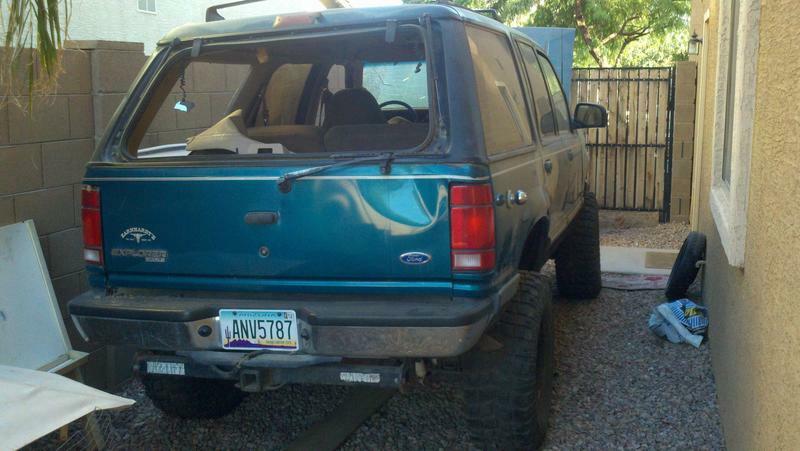 The most likely situation will be parting it out to whoever needs anything. Anyone need a running engine or a4ld transmission? If anyone has any suggestions, ideas or comments please speak your mind. I towed it home last night and started giving it a once over in my garage. I was very unhappy to find that the gears are stock 3.73 limited slip gears, and the bearings in the differential are worn and need replacement anyway. Since my X already has 3.73 limited slip, I'll just go down to 4wheelparts and buy some new spring perches. I figure this will save me a lot of time since I won't have to take apart the brake assembly to get the parking brake cable off. 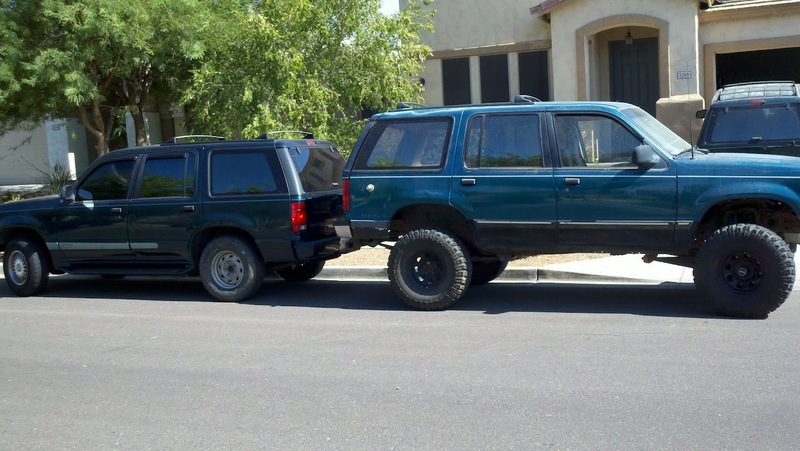 The new donor vehicle is on the right, the one the lift going on is the 1994 Limited on the left. well, if the donor's body is already semi-wasted.. I'd prolly take that puppy out and wheel it a few times! I mean hey - if it's not a keeper, no biggie if you bang it up some, right? After one day of work I got the front end of the donor vehicle completely disassembled. I went through and took every part I am going to need for the lift and set it aside. I got some new spring perches from my local 4wheelparts for $16.99, and I am nearly finished grinding them down from 3" to fit my 3.25" axle tube. The only parts I will need to swap from the rear end are the shocks and the square U bolts. I am going to see if I can get my days off together next week so I can disassemble my '94 and reassemble it in one go. I can probably do it in one day, but I will have to do that one in my driveway since I have no more room in my three car garage/workshop to fit the second vehicle. The donor vehicle came with long travel Rancho RS5000 shocks and the squared u bolts already on it. The clearance lost by putting the u bolt plate on the bottom is negligible, and actually makes the axle mount slightly stronger by utilizing the stock spring perches as a flat mount. Thanks for the tip. I have been researching this lift for a few years now, and wasn't planning on doing it anytime soon, but this donor vehicle basically fell into my lap. There is always the chance that there is some piece of information that I missed though.